Synod ’16. Archdiocese of Detroit. Get pumped. YO, DOG, there are some really, interesting, exciting developments in the Catholic church (A) across the world because the Holy Spirit is always active* and (B) in Detroit. And we’re going to talk about point B because IT’S MY PLACE, BEEBEE. (*Obviously, the Holy Spirit is not bound by Catholicism, too. Obviously. Quote I heard yesterday: “The Holy Spirit is not going to wait for the church to act,” and if that made me little sad from the promise that I might miss out on working tandem with the Holy Spirit so, breathe on us, Spirit of God). If you just want to talk about clothes and food and stuff, you’ll need to come in another day because this one is more dedicated to the Holy Spirit/ church politics/ Jesus-stuff planning. If you are me, then you are excited and like, “Shoot, tell me all the thingssssss,” and I’ll do my best, by golly. This is literally one of my all-time favorite gifs. Please judge me. And I said, “Yes,” even though I had no idea what it would entail. Sometimes I jump into things without knowing everything first. And, many times, that works in my favor–like this time, for instance. 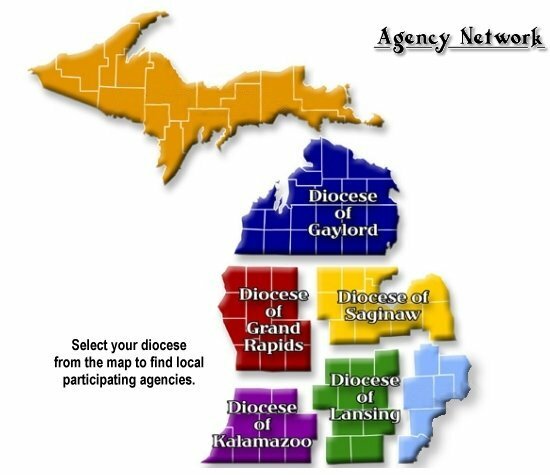 A “diocese” is an physical area or district that is under the care of a specific bishop. In secular terms, it’s kind of how a governor has an area to govern. “Archdiocese” is under the care of an archbishop. Also, a collection of dioceses, in the grand scheme of things, kind of answer to their local Archdiocese, but that’s more technical than anything (in my experience). Pic from Catholic Charities. The light-blue part is the Archdiocese of Detroit. “Synod” = a word that is unfamiliar, I know. Plus, it’s a twofold word, which makes it extra confusing. First of all, a “Synod” is an event where literal people gather and pray and make decisions for what the future should look like, through the lens of “Church.” But, the “Synod” is also a process. So, in November 18-20, 2016, there will be an event held in Detroit where people gather, but there are also a lot of things going on that will lead up to that event. Event + process, then, = Synod. Dude. How many words do I get? So, basically, it’s no secret that people across the U.S. have kind of looked at organized religion and said, “Eh. I can do without this.” And, now, pews are empty and churches are closing and people aren’t getting married and babies aren’t getting baptized. I want to take a kangaroo-style hop away from the snarky comment that is, “And now there isn’t as much money in the collection plates,” because that’s stupid and 1000000% doesn’t matter. Have you met God? That one being who created the universe? He makes a way, and so the money thing isn’t the scary thing. The scary thing is that Jesus offers beautiful, full, meaningful life to people–way, way, way beyond what any of them could hope or imagine on their own. Plus: community. Plus: personal growth. Plus: better human experience. Plus: meaningful acts of love that, frankly, require sacrifice and a lot of tears sometimes, but, in the end, the world is a better place–and isn’t that a worthwhile goal? And, basically, all of us have friends and family who are now missing these experiences that make life good and adventurous and worth living. Again, this is a wide-spread phenomenon. But, we are a local church, and we need to address it on a local level, too. Hence Synod. Our Archbishop (God bless him) has put this process into play that aims to change the church from being “maintenance-minded” to “missionary-minded.” This Synod hopes to change (in his words) the “very DNA” of how we “do church” with regards to evangelization. Also, this is the logo. Now you know. Do you want to hear about the last time we had a Synod in the Archdiocese? I can fill you in. It was in 1969. Prior to that (from what I understand, I wasn’t borned yet, and my parents hadn’t even met/ graduated from middle school) the church functioned in a very top-down kind of way. The priest would say, “X” and the church would do “X.” The 1969 Synod flipped that. The 1969 Synod was like, “Here’s a requirement: lay involvement,” and now every parish has something called “finance council” and probably a “pastoral leadership council,” among many, many others. Today, if a priest said something like, say, “Hey, church, we’re going to open a school,” and he didn’t consult/ discuss with all of these others councils, it would be weird and wrong to us. Which is to say: the 1969 Synod completely changed the way we “do church” with regards to lay involvement. (“Lay” people are people who are not ordained or religious i.e. anyone who is not a priest or a nun or something like that is a lay person. I.e. huge majority). Guy in the collar = a priest. Everyone else = lay person, probably. What will be the result of this Synod? We have literally no idea. Literally none. The entire process has been proceeded and surrounded by prayer to the Holy Spirit, though, and we have full confidence that He will make himself manifest. What if, instead of “RCIA” being a total weird shrouded-in-secrecy that even the faithful in the pews don’t know all that much about…it could be something awesome that we would love to tell our friends about? What should catechism for our young people look like if we could do anything and not just an hour on Mondays because that’s what has been done since 1943? Should we have that class for parents, instead? So that the parents can turn around and teach their kids? What should our marriage prep look like? How can we make it formative and excessively helpful to these couples getting married? When should masses be held? Everything, you guys. EVERYTHING. If how we minister can change (and, for the most part and barring theological error, it can) then let’s just open the doors and see the Spirit move/ work/ love. Because you could be. If you wanted to. I might be able to help you get more excited, though. As it turns out, a lot of dioceses are doing Synod-y things. Good for them. Detroit, though, is bringing the funk. Every pastor in the Archdiocese of Detroit (over 200 parishes here, btw) was asked to prayerfully submit 3 names for people at their church who seemed to be good listeners/ attentive to the Holy Spirit/ courageous followers of Jesus. Each applicant submitted an application about how the Holy Spirit worked in their lives. And, all of the applications were read and prayed over and one person from every 3 parish applications was elected to sit in on this Synod. (Disclaimer. Obviously, this wasn’t a seamless process because sometimes applications were late or two parishes shared a pastor and so sometimes the numbers were slightly different, but, generally speaking, I think you get the point). From what I understand, in other dioceses, maybe a crew of 7 people were asked to attend the Synod. In Detroit, though, we’re asking hundreds. People from all walks of life, from all kinds of urban and rural areas, all ages, both genders are going to convene to talk Jesus and church and Holy Spirit and future. Incredible, historic moment for our Archdiocese. Also, leading up to the Synod event, churches across the Archdiocese are hosting specific parish missions and Eucharistic adoration events to pray for this and prepare. Also, every single parish is invited to host sessions where any parishioner is invited to come and share how the Holy Spirit is moving here already and other such faith experience things, so that that information can be compiled and addressed come November. Dude, is this not kind of thrilling? Our Archdiocese is taking strides to change churches/ schools/ institutions/ communities with an effort to focus all of us more on Jesus and helping us to tell others about Jesus. I wish I could write words that accurately convey the ways I feel hope and light and life from this process. But, I’ll probably fall short. So instead I decided to fill you in a little bit on what has been going on over here. If you want to read more information, I think that that’s a good place to start. Synod, ya’ll. Git rowdy. Git pumped.